CONGRATULATIONS CLASS OF 2018! 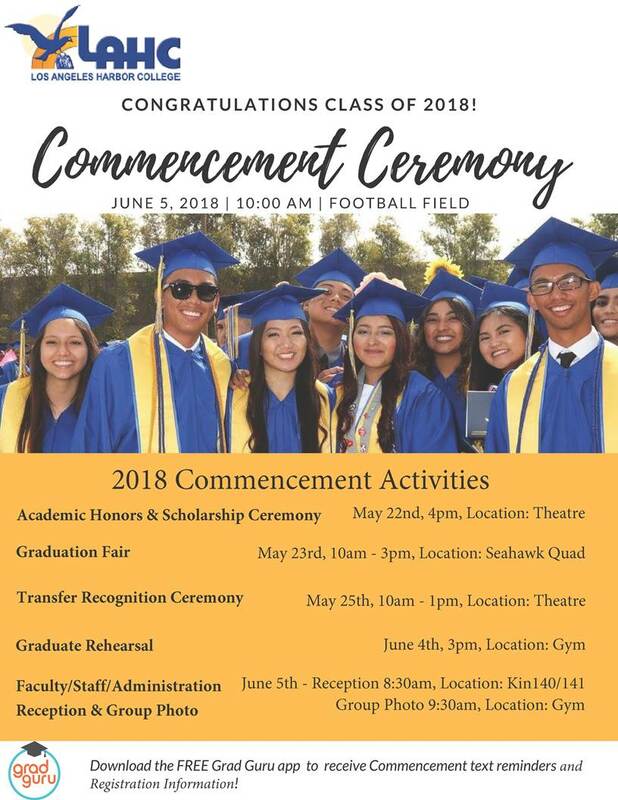 Los Angeles Harbor College has scheduled the Commencement Ceremony on June 5 at 10 a.m. at the LAHC Seahawk football Field. 2018 Commencement Activities start on May 22 thru June 5, beginning with Academic Honors & Scholarship Ceremony Graduation Fair, Transfer Recognition Ceremony, Graduate Rehearsal, and finally on June 5 Faculty/Staff/Administration Reception & Group Photo. CONGRATULATIONS CLASS OF 2018! There has been a change in the graduation submission policy; the March 2 deadline is now a priority date. In order, to have students’ names on the commencement program, the counselors must receive the petition by Thursday, March 22. For more information contact your counselor.